There is this show on the cable network Slice called Til Debt Do Us Part. In it, host Gail Vaz-Oxlade helps couples solve their spending problem and the crushing debt burden that it caused. There is a moment in every episode after Gail does all her calculations that she meets with the couple – usually in the kitchen for some reason – and gives them the bad news: “If you keep spending like this, in 5 years you will be $700,000 dollars in debt.” She then gives the stunned couple a series of challenges to turn their state of affairs around. I think you know where I’m going with this, but I felt as though I was standing in that kitchen with Gail when I looked through Manitoba’s budget documents a few months ago, and now the recent chatter about infrastructure spending has brought that feeling back. 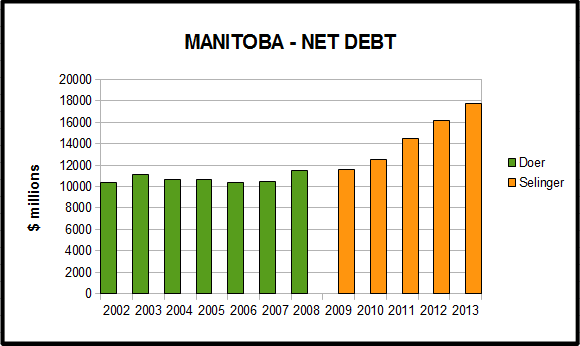 Manitoba’s net debt has increased 53% in the past 5 years, from $11.6 billion in 2009 to $17.8 billion with the 2013 budget. That’s not good at all, but that’s not all that got me thinking about Til Debt Do Us Part. It was also looking at what’s happening to our “Rainy Day” fund. What’s happening is that it’s disappearing. And it’s not just that it’s disappearing but why it’s disappearing. As I was looking into this, I also started digging into what used to be the Debt Retirement Account, and together they paint a picture of a province that has badly lost it’s way in terms of managing its finances. 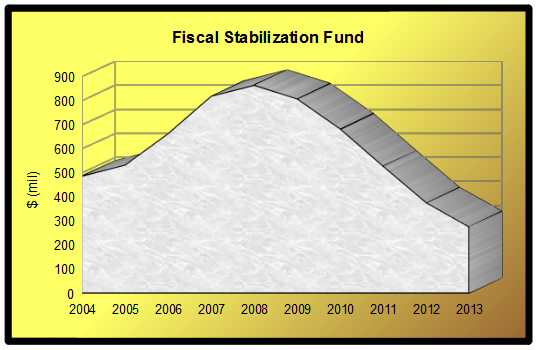 The Fiscal Stabilization Fund was created in 1989 with the Fiscal Stabilization Fund Act (imagine that). It’s purpose: “to assist in stabilizing the fiscal position of the government from year to year and to improve long-term fiscal planning.” The idea was that in years with a surplus the government would contribute to the fund. If we had a bad year, say a big flood or something, the government could draw from the fund to help stabilize the fiscal position of the province. This more or less happened up until 2008. Every year the Manitoba Government contributed to the stabilization fun, and on occasion it would draw a chunk of money out, like in 2003 (an election year, by coincidence) when government expenditures jumped over 7%. The result was that, until 2008, the Fiscal Stabilization Fund fund kept growing, and Manitoba’s fiscal situation was stable. Things started to change in 2008. The economy started to slow down, revenues didn’t increase as quickly as before, and the government made a decision: they repealed the Fiscal Stabilization Fund Act. Like the old saying goes: when the going gets tough, burn your safety net. In 2009 provincial revenues fell flat. The government was not able to adjust, overspending it’s budget by $167 million and running what would be the first in a string of large deficits under new Premier Greg Selinger. It began drawing down the $864 million fiscal stabilization fund to cover pension shortfalls. With no more money going in and only money coming out, the fund began it’s decline. There was one other tool in the government’s debt-fighting toolbox: the Debt Retirement Account. Established by Gary Filmon’s 1995 The Balanced Budget, Debt Repayment and Taxpayer Accountability Act, the Minister of Finance was compelled to contributed to this fund every year “until the minister is satisfied that the balance in the account is sufficient to retire the general purpose debt and eliminate the government’s pension liability“. Anyhow, every year the government dutifully contributed $110 million to the fund .. until 2009 when that amount dropped to only $20 million. Government revenues rebounded, increasing by 4.5%, but it was too late: we had started the slide and the government still couldn’t make any serious effort to control spending. Instead they made a bold move: they killed the Debt Retirement Account and drained the entire balance to pay part of their accumulating debt. The phrase “period of recovery” implied that this was only a temporary measure. It was not. We were spending more than we could afford, and the government needed its rainy day fund to help pay down it’s credit cards. Yet the credit cards balances continued to grow. That year the net debt increased by $900 million, in spite of the government’s desperate efforts to stem the flow by drawing $241 million from it’s long term savings. Then came 2011 and the big flood. The provincial government increased spending by over $1.4 billion from the prior year, and in the process racked up a billion dollar deficit. It should be noted that the flood accounted for less than half of that, but it was still big hit. In a situation such as this, the government might be advised to tap into its rainy day fund to … you know … help it out on a rainy day, but that was no longer an option because the government had become reliant on the fund to support its unaffordable program expenditure. The government drew only a paltry $11 million from the fund for flood-related costs, but took out another $96 million to partially cover borrowing for “core government programs”. The Debt Retirement Account was by then a distant memory, the net debt ballooned by an astonishing 15.9% in one year, and the fiscal stabilization fund was no longer stabilizing anything. It had become built into the living expenses of the province, like a retiree drawing down his RRSP. In the following two years the province continued to record double-digit percentage increases in it’s net debt in spite of there being no major floods, and the fiscal stabilization fund continued to get drawn down. The “new normal” is a $1.6 billion increase in net debt per year and unsustainable spending compensated in small part by consuming our diligently built rainy day fund. If this trend continues, the fund will be completely gone in three years. In 2016 there will be no debt retirement fund, no fiscal stabilization fund, no safety net. A stable source of income that the government was relying on will be gone. The $100-150 million a year that they were drawing from the fund will have to come from somewhere else. All other things being equal, this will simply get tacked on to the annual deficit. Should another disaster happen, and it will sooner or later, the province will have nothing to buffer the fiscal impact. If you don’t have enough money to buy groceries each month, how are you going to pay for the new water heater when it breaks down? This is how: you put it on your credit card. I have more bad news: eventually the rate of interest on those credit cards is going to go up. We are experiencing an unprecedented period of low interest rates right now, but even still our debt servicing costs are over $800 million per year, and at some point we are going to have to pay higher interest on these billions that we owe as a province. If Manitoba’s credit rating gets downgraded, as is likely to happen if this trend continues, then again: higher interest payments. Everything that I’ve talked about so far is related to core government operations. The $20+ billion capital investment plans of Manitoba Hydro are beyond the scope of this post, but will also add to the crippling debt that ultimately belongs to Manitoba taxpayers. I don’t want to get into that just now … maybe some other day. The government can claim that it’s on track to balance the budget in three years, but that is simply not the case, and we can see hints of that in the Premier’s own words. All signs point to a gloomy financial outcome for the province, one that drastic action would be required to reverse. You have to wonder: what would Gail Vaz-Oxlade say if she were to look over our books and go face to face with Greg Selinger in the kitchen? ← UPDATED: The Premier is “probably” lying. Great article. This should be on the front page of every local newspaper. Too complicated – the masses will gloss over it. I like to envision where we would be without Alberta’s funding. Now that would be an interesting discussion. ItsWorse: perhaps some time I might delve into equalization. What I find most disturbing is how many Manitobans either turn a blind eye or lap up the lies and falsehoods without question. I want one that shoots lasers out of its arse. I had to gulp after reading that. Awful.